A bottle of blended apple brandy, along with a Jack Rose, a cocktail made with applejack. Applejack is a strong apple-flavored alcoholic drink produced from apples. Popular in the American colonial era, the drink's prevalence declined in the 19th and 20th centuries amid competition from other spirits. 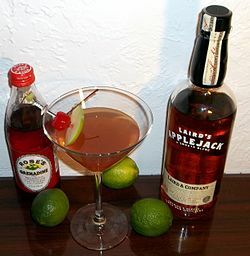 Applejack is used in several cocktails, including the Jack Rose. Apple brandy was first produced in colonial New Jersey in 1698 by William Laird, a Scottish immigrant who settled in Monmouth County. The drink was once known as Jersey Lightning. Laird's great-grandson, Robert Laird, who served in the Continental Army, incorporated Laird's Distillery in 1780, after previously operating a tavern. The oldest licensed applejack distillery in the United States, Laird & Company of Scobeyville, New Jersey, was until the 2000s the country's only remaining producer of applejack, and continues to dominate applejack production. Once popular in early America, applejack declined in popularity due to the rise of other spirits that were easier to manufacture on a commercial basis, including rum, bourbon, and whiskey in the 19th century and gin, vodka, and tequila in the 20th century. In 1920, with the beginning of the Prohibition era, Laird's ended the production of liquor and began producing apple juice. In 1931, John Evans Laird received permission to produce apple brandy for "medicinal purposes" and stockpiled its product until the repeal of Prohibition in 1933. Applejack has been associated with four presidents of the United States: George Washington requested instructions for producing applejack from Robert Laird for the family's recipe for applejack; Abraham Lincoln served it during a brief stint as a tavern keeper in Springfield, Illinois; Franklin D. Roosevelt included applejack in the Manhattans he regularly consumed; and Lyndon B. Johnson gave a case of applejack to Soviet leader Alexei Kosygin in the 1967 Glassboro Summit Conference. In the 2010s, a number of smaller craft distilleries began to produce applejack in places such as Lehigh Valley, New York's Hudson Valley, and Holland, Michigan. The name applejack derives from the traditional method of producing the drink, jacking, the process of freezing fermented cider and then removing the ice, increasing the alcohol content. Alcoholic fruit beer produced after the fall harvest was left outside during the winter. Periodically the frozen chunks of ice which had formed were removed, thus concentrating the unfrozen alcohol in the remaining liquid. Starting with the fermented juice, with an alcohol content of less than ten percent, the concentrated result can contain 25–40% alcohol. Because freeze distillation is a low-infrastructure method of production compared to evaporative distillation, and does not require the burning firewood to create heat, hard cider and applejack were historically easy to produce, though more expensive than grain alcohol. The disadvantage of freeze distillation, also called fractional crystallization, is that the substances remaining after the removal of the water include not only ethanol, but also harmful methanol, esters, aldehydes, and fusel alcohols. Reducing methanol with the absorption of 3A molecular sieve is a practical method for production. When commercial production began, applejack was also starting to be produced through evaporative distillation. Modern commercially produced applejack is often no longer produced by jacking but rather by blending apple brandy and neutral grain spirits. Applejack is somewhat similar to Calvados, an apple brandy from Normandy, France, to which it is often compared. However, Calvados is made from cider apples, while applejack is made from apples such as Winesap. ^ a b c d e f Ken Albala (2010). "Applejack". In Rachel Black (ed.). Alcohol in Popular Culture: An Encyclopedia. Santa Barbara, CA: ABC-CLIO. p. 10. ISBN 978-0-313-38048-8. ^ a b c d Karen Tina Harrison, Jersey Lightning, New Jersey Monthly, July 13, 2009. ^ a b c d Ralph Ginzburg, Harvest Is In at Centuries-Old Distillery, New York Times (October 26, 1986). ^ Joseph D'Agnese, In Search Of ...; Not Your Toddler's Apple Cider, New York Times (June 11, 2000). ^ Kurt Bresswein, How it's made: Apples to applejack in the Lehigh Valley, lehighvalleylive.com (November 2016). ^ Kara Newman, Are People Taking Applejack Seriously Now? Johnny Appleseed goes craft, Bloomberg News (February 4, 2016). ^ Garret Ellison, Applejack is back: Coppercraft Distillery goes to market with historic American spirit, MLive.com (September 30, 2014). ^ Matthew B. Rowley, Moonshine! (Lark Books, 2007), p. 141. ^ Eric Asimov, An Apple Orchard in a Glass, New York Times (December 8, 2004). This page was last edited on 14 April 2019, at 02:18 (UTC).